MP Vyapam JSO Admit Card 2019 Fishery Inspector Lab Assistant Exam Date: The Madhya Pradesh Professional Examination Board ready to hold the examination for various positions among these they also issue the MP Vyapam JSO Admit Card 2019 Junior Supply Officer, Analyst Lab Assistant, and Fishery Inspector vacancies. MP Vyapam will conduct a written competitive test for the posts said above. Also, good news for applicants is that the authority has scheduled the examination for 2019. Those who have registered for the state government jobs, must respond to this update and proceed to check their MP Vyapam Fishery Inspector Lab Assistant Exam Date. All such information is generated below. The state government of Madhya Pradesh came up with an official notice regarding the vacant posts of Junior Supply Officer, and Fishery Inspector, and Analyst Lab Assistant. Applying for 219 vacancies, thousands of candidates have made their way to online registrations. Now, the net update is about releasing entry tickets for the prospective examinees. All the highlighted jobs are of graduate level hence, many eligible candidates are in the competition and await the official declaration on MP Vyapam Fishery Inspector Admit Card. It is time to have the latest news about the ongoing recruitment and the selection phases to be conducted. Kindly, adhere to the official instructions important for examinees and guidelines necessary to download MP Vyapam Lab Assistant Exam Admit Card online. Below are the exam pattern followed by the instructions to follow. Every contending participant should keep the same in mind in order not to have any trouble while attending their exams respectively. Since the selection is for Group B category, degree level exam is expected to be a harder level. Therefore, the following pattern will be followed by the recruiting authority. Note: The current recruitment and selection process is to be carried out at the state-level only. Thus, most of questions included in the General Awareness will be related to State’s History and Civics. The examination is categorized into sections Paper-I and Paper-II. Paper-I (100 Marks) consists of General Knowledge, Computer Knowledge, General English, Numerical Ability, Hindi, and General Awareness. Paper-II (100 Marks) contains questions related to Professional Aptitude. The time duration for the test is 2 hours. Kindly retain a hard copy of your MP Vyapam JSO Admit Card along with an original ID card (Aadhaar Card, PAN card, Voter ID, Passport, or Driving License) to present to the Invigilator/Official at the entry gate. Please check the examination venue and time to report very carefully. Use of smart-phones, calculators, cell phones, electronic media, or smart/digital watches is prohibited. Once, started their exam, candidates are not permitted to leave their exam in the middle and need to hand their OMR answer sheets to the invigilator once finished the examination. Dear Entrants if you are looking for the selection process then here we have to tell you that selection is completely based on the performance of candidates in JSO, Fishery Inspector Written Examination, Personal Interview. All those entrants who are going to shortlist for the Written Examination must go through the Interview process. In the end, the Madhya Pradesh Professional Examination Board issue the merit list or selected candidates list which is the final pdf of qualified aspirants for the suitable positions. Enter “www.vyapam.nic.in” in the URL bar of the Google browser and land on the homepage. Look for the recently updated notice and follow it reach the candidate’s login page. Supply your “Registration Number” and “Password” and submit the values. 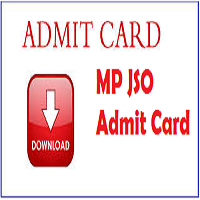 Generate a hard copy of your MP JSO Admit Card to use it in the future. Check the official link mentioned in the following segment and proceed to obtain your Madhya Pradesh JSO Fishery Inspector Hall Ticket online. For more details about the examinations and the rest of the selection processes, stay tuned. Visit here and Obtain your MPPEB JSO, Fishery Inspector, Lab Assistant Hall Ticket.